I only started to appreciate traditions and festival foods after I came to live in Finland, a place that has winter more than 6 months, celebrates to the midnight sun during the summer that lasts no longer than 2 months. It is clearly different than where I came from, Malaysia. As Malaysian Chinese, we carried out many practices originated from China. 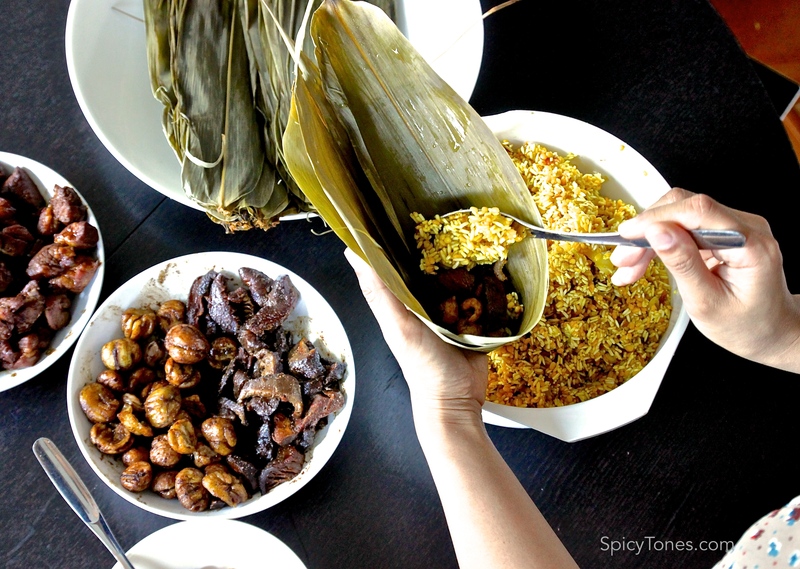 Some food and cultures have been also created only in Malaysia partly influenced by the Malay, Indian and European cultures. 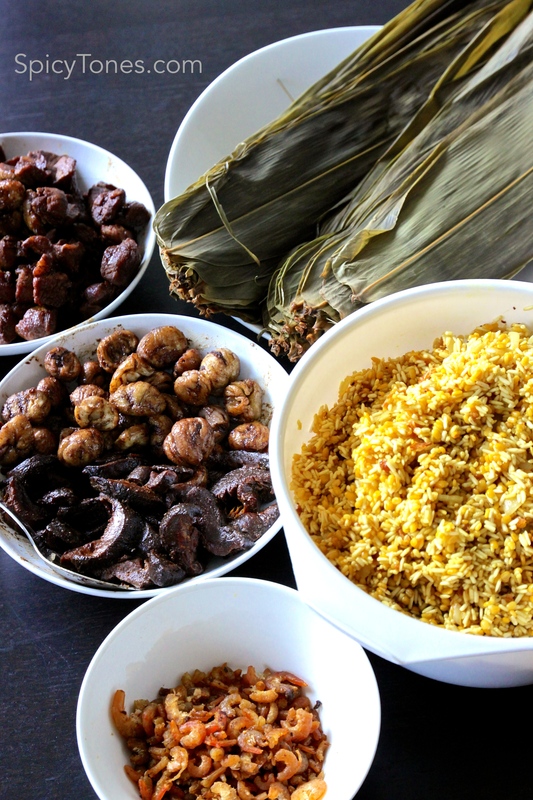 To name, black pepper crabs, pork ribs in herb tea, fish head curry are becoming some of those signature dishes of Malaysia. This dish I’m introducing today is one of those festival dishes originated from China. 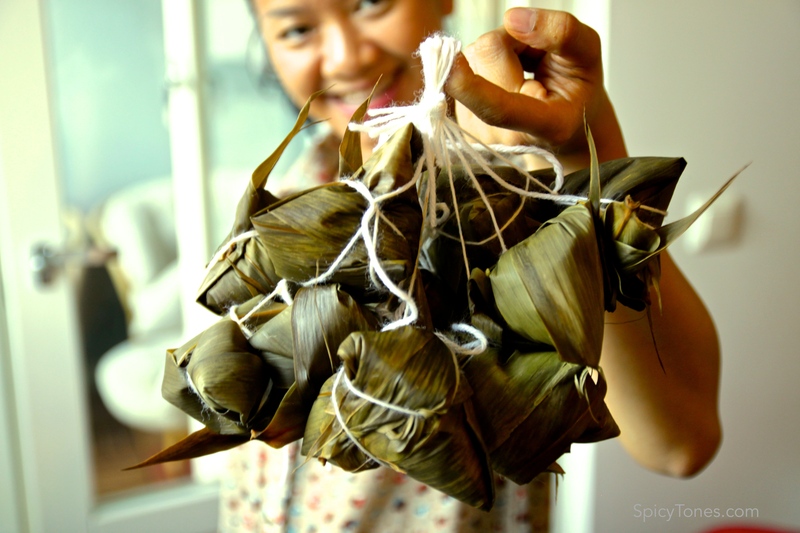 Making glutinous rice dumpling or ‘Zongzi’ in Chinese, during the Dragon Boat Festival remains one of those practices carried on from generation to generation. 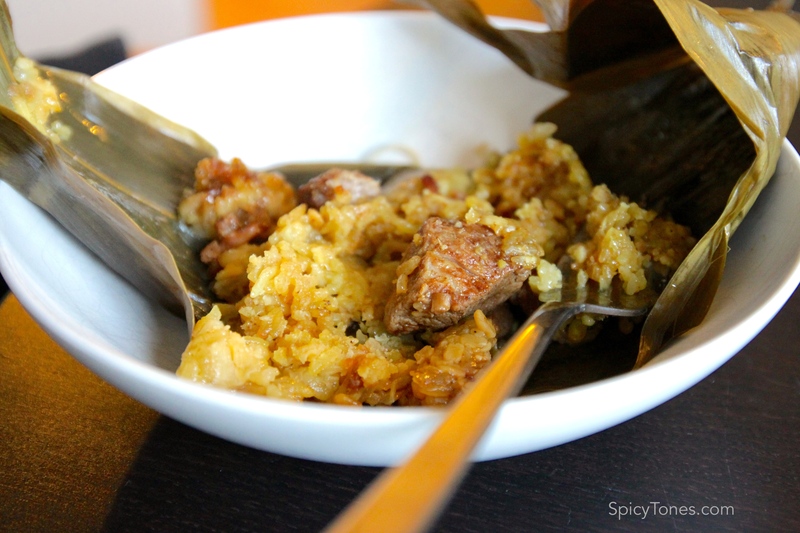 There is a nice story about the history of making glutinous rice dumpling. You may go ahead and google, all I will tell you is that this dish was supposed to be for fishes not human. 😀 Well, now it does not sound as tempting anymore, does it? No worries, this is not the same anymore compared to how it started. It is safe to be consumed by human and super delicious! Should have correct her immediately that she is the only one and the most beautiful thing to be seen in that empty house. I tried to call her every week and if not, I feel guilty and regret that I didn’t. Too bad there is a thing called time zone differences in the world. It makes it rather difficult to reach her before her bedtime. I’m sure my grandma would be very proud of me for making these rice dumpling all by myself. Oh well, my sister helped a little. 😉 I can’t see but next time when I tell her this, I’m sure she will be smiling like this. 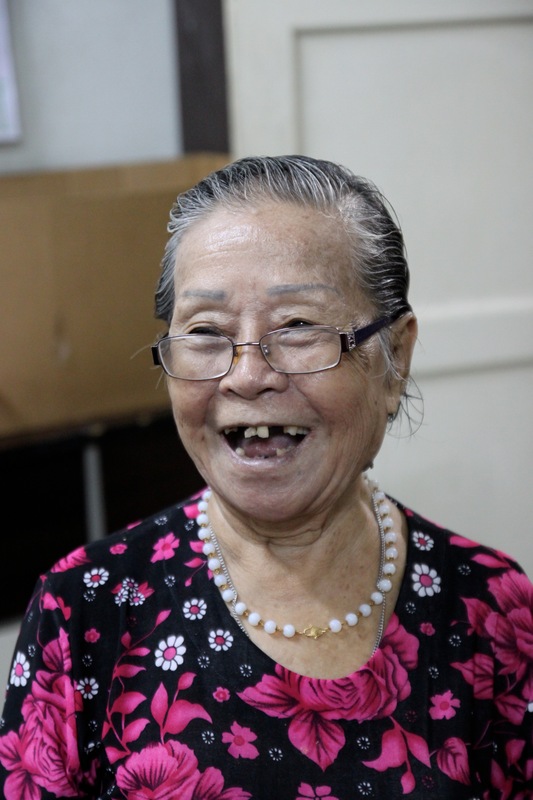 Here is to my Popo, my beloved grandmother. WARNING! 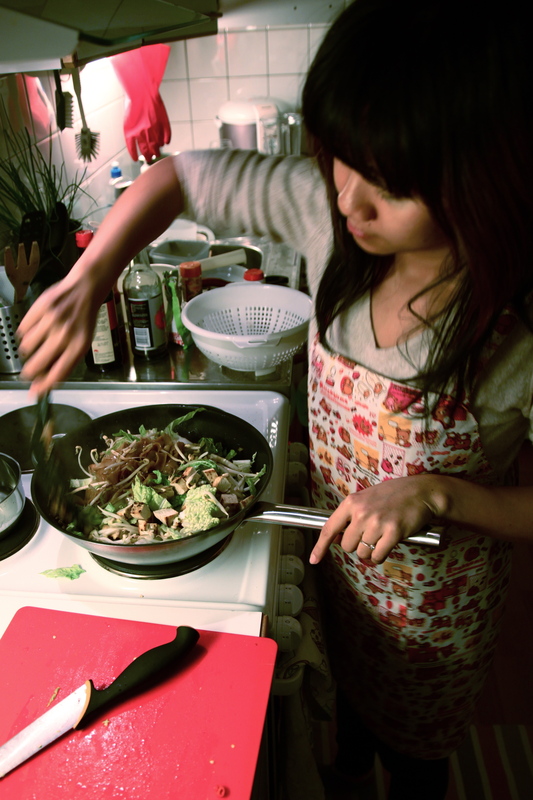 THIS IS A VERY COMPLICATED AND TIME CONSUMING DISH! 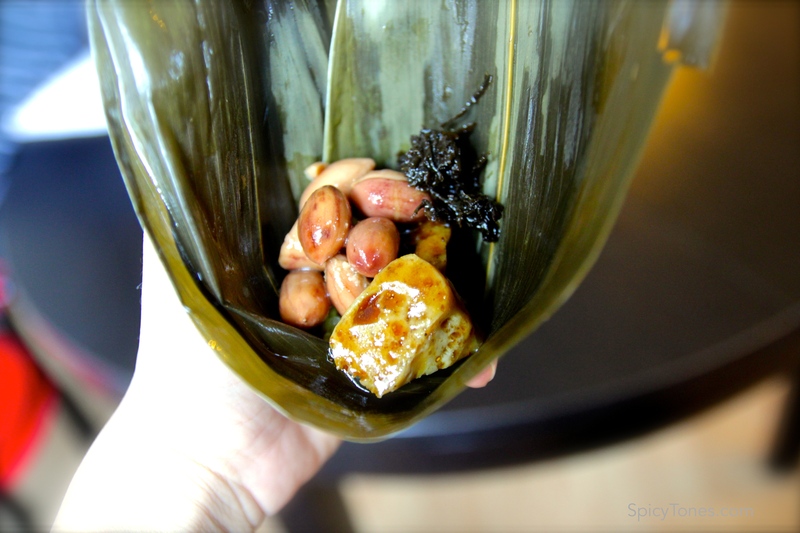 1) (Ingredients A) Soak glutinous rice, peeled split mung bean, dried chestnut, dried bamboo leaves and dried shiitake mushroom in water separately overnight. Washed and drained. Mix glutinous rice and mung bean together with 2 tbsp oyster/mushroom sauce, 2 tbsp sesame oil and 2 tbsp soy sauce and deep-fried shallot in a bowl. Set aside. 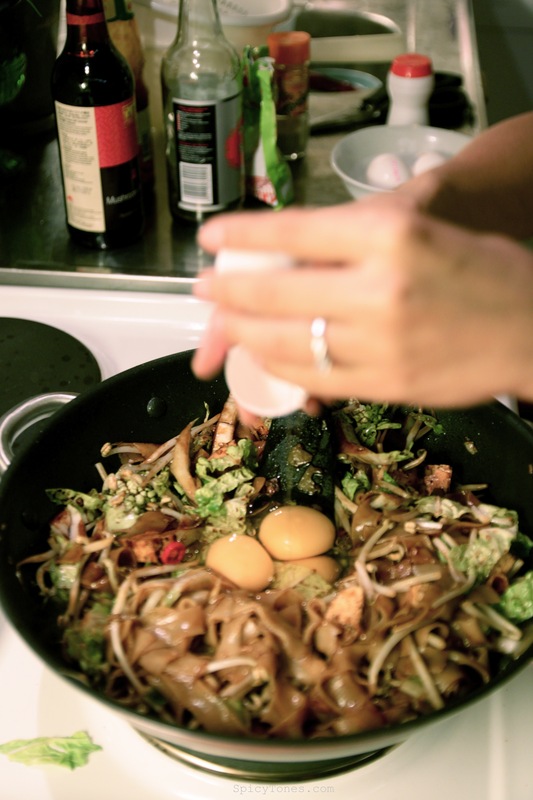 2) Heat up oil in wok pan, stir fry mushroom and chestnut separately with the rest of the sauces, place also separately. 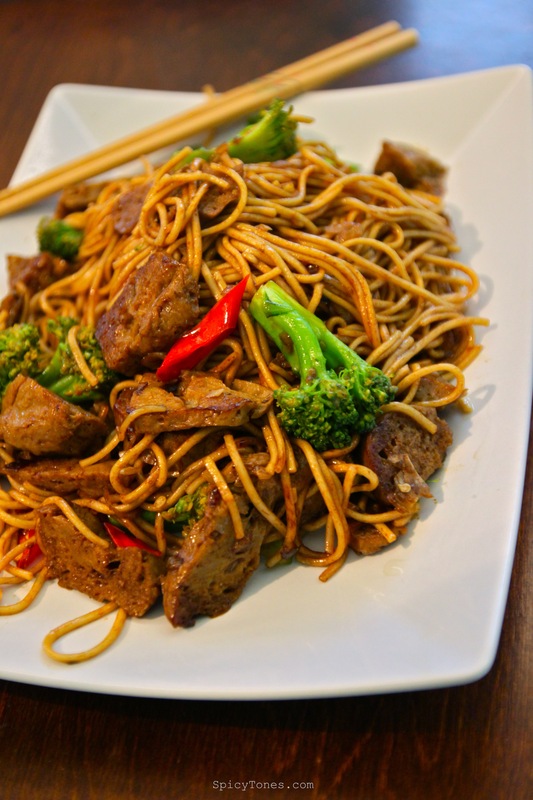 2) Fry pork in oil with garlic, add oyster sauce, soy sauce, dark soy sauce and 5 spice powder until cooked. 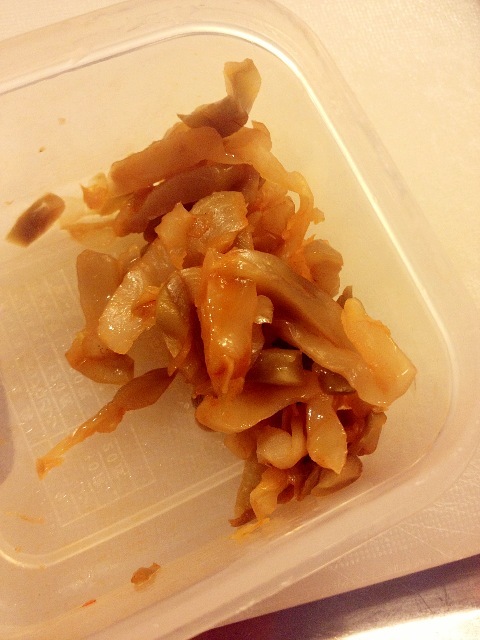 Meanwhile, toast dried shrimp in hot pan with a little bit of oil until fragrant. Set aside. 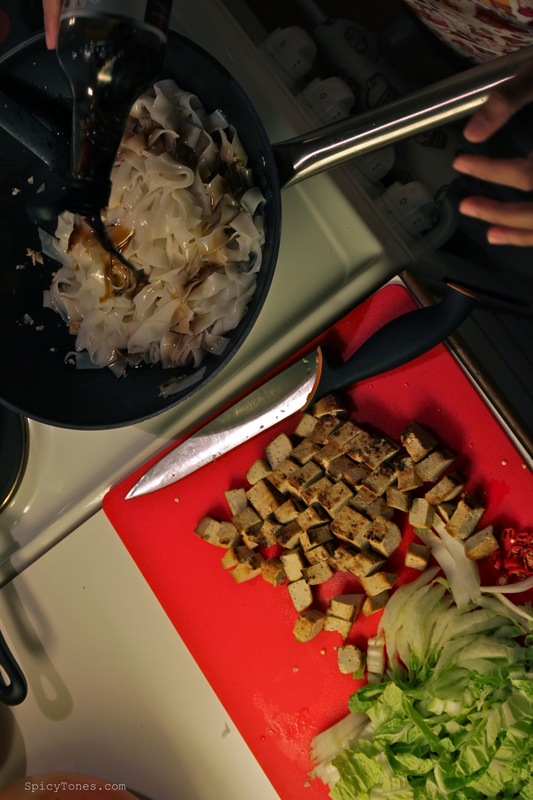 2) Fry seitan in oil with garlic, add in mushroom sauce, soy sauce, dark soy sauce and 5 spice powder and mix well. Meanwhile toast peanut with a little bit oil and salt. Set aside. 3) To make a rice dumpling, placed 2 bamboo leaves together horizontally and put both ends together to make a pocket. Put in 1 tbsp of rice-mung bean filling, add one piece of everything on top: mushroom, chestnut, pork/seitan, peanut, some Chinese preserved kale (optional) and salted duck egg (optional). Top up more rice-mung bean filling to cover up. 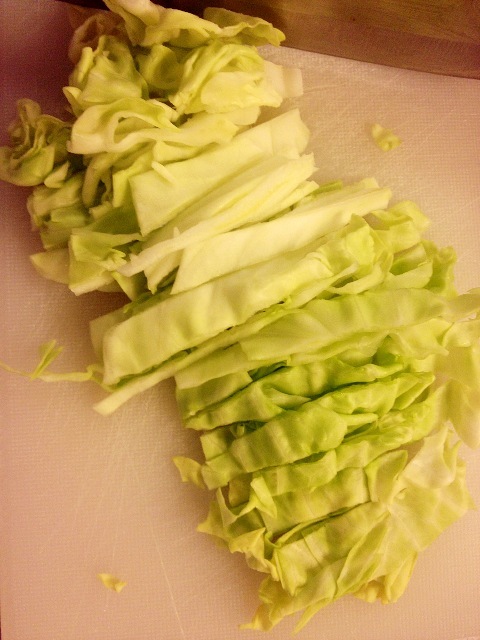 Fold the leaves to closure, wrap the dumpling tightly with strings. 4) Cook rice dumplings in a deep cooking pot with enough water that covers them. Add 1 Tbsp of salt. Bring to boil, turn the heat to medium low, cook the dumplings for 4 hours. Enjoy as breakfast, lunch, snack or dinner. 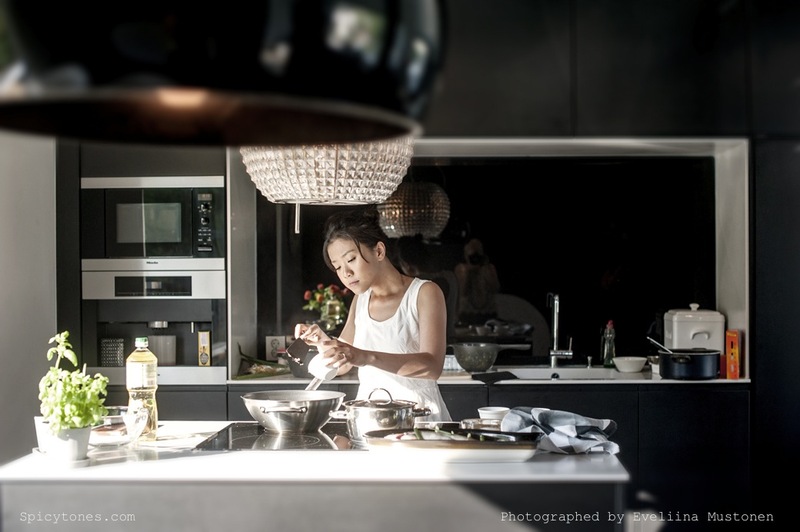 It is important to tight the rice dumpling well and firm in order to prevent leaking during cooking process. FYI, 2 of mine leaked. 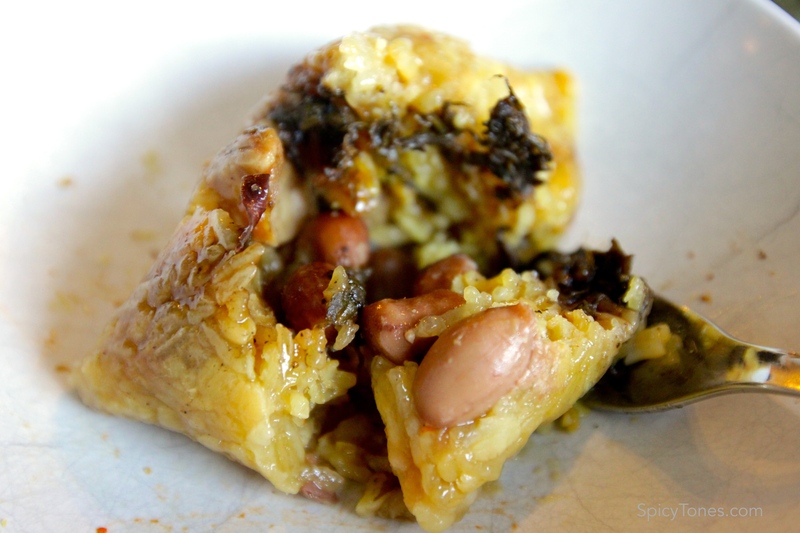 Here is my vegetarian version of Zongzi. 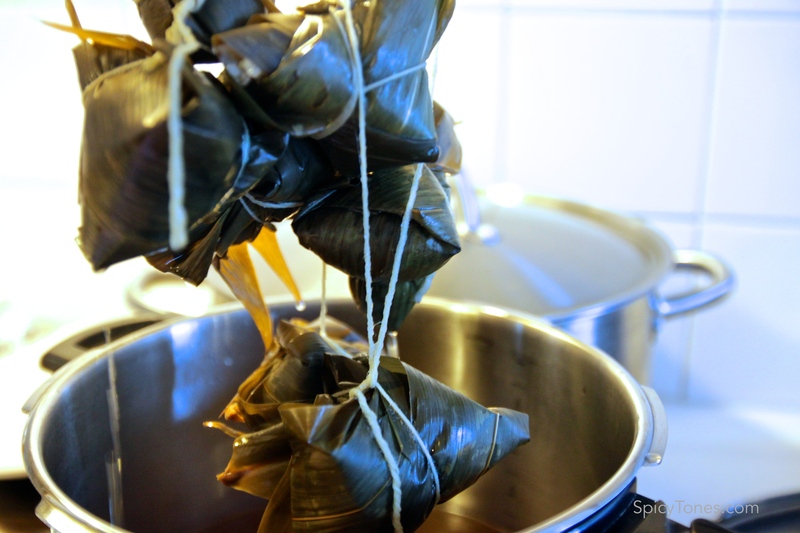 With a pressure cooker, it only takes 40 minutes to cook the glutinous rice dumpling (Zongzi) ready. 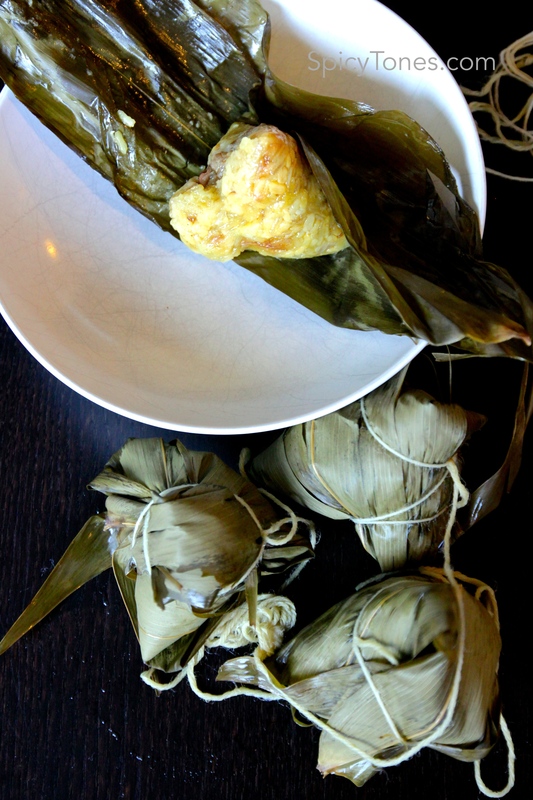 There are many ways to wrap a rice dumpling. Be creative and make your own style! No stress. If you may wonder, the main flavour of this dish comes from the fragrance of the bamboo leaves: woody, tea like aromas, hard to describe, very unique indeed! You may not know because I haven’t told you yet, I have turned from a waitress/host to a chef for a few weeks now for my sister’s hotel HUONE . It has been fascinating, thrilling and a little tiring. 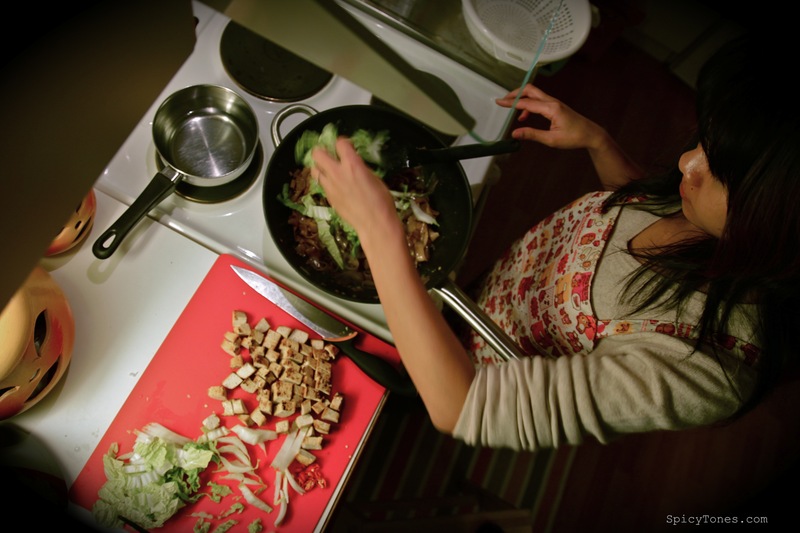 But I was surprised by just how much I love cooking, in a way that working does not feel like work anymore. Sometimes I feel like I have been cooking all the time, which is the truth anyway. But it does not feel bad at all. I have been enjoying a lot especially from receiving compliment from my customers. Since I started cooking in HUONE, no food has been going to waste, period! 😉 I felt moved every times when I saw those empty plates coming back to the kitchen representing ‘plates licking good’! It has been a rewarding job, a place to be creative, versatile and challenging which I really enjoy. I think I am just the kind of person who simply cannot cope with repetition and homogeneous life. The only minus from my work is that I’m cutting and cooking a lot of meat. You know what, it really doesn’t make me feel good. Raw meat smells nasty to me, I feel kind of guilty of cooking them, as if were killing lives. The smell of raw beef is worse, imagine those blood on my hands and knife … But this is my job, to cook and serve to the customers. I’m glad that I’m not a butcher though. Is there a way you could think of? I have been doing some thinking, what if I serve vegetarian food like out of request? What if I make it tastes so good that nobody would actually realize? Is it possible? Then I tested it on last Monday since they call it Meatless Monday. I was trying to make it sounded good, Pumpkin and Chickpea Curry with Minced Lime Leaves for our buffet lunch. But the thing is, my customers were not happy when they heard the word ‘vegetarian’. To be exact, they had their lips curved downwards after they heard what they have for lunch. They liked the food though, that what they said. No food was going to waste still. But it bothers me because I knew that they didn’t enjoy it, especially men, those Finnish macho men ( no offense guys!). I was told that in Finnish culture, the term ‘vegetarian’ in menus sounds cheap, because it is always the cheapest option. Moreover, for some reasons people tend to assume that they will not get full with vegetarian food, which is not true. Well I think it definitely makes people feel lighter compares to meat dishes. Am I supposed to convince myself that the concept is not working in our hotel? Shouldn’t I apply my own values and ethics onto my customers? Should I respect the food preference of Finns and just cook what they expect from their lunch, and keep the idea of vegetarianism to myself? You know I have a dream of having a vegetarian Asian restaurant in Helsinki one day. Is it going to happen? Well, if you have something to say, let me hear your voice. Or should you have some great recipes, share me yours. So that I could test it to my customers on Monday! Back to the recipe. 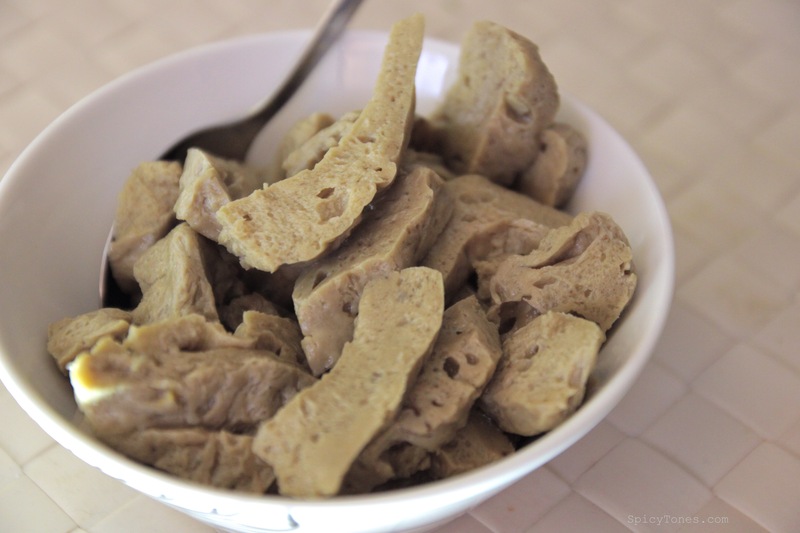 Last time I promised to share you a recipe with seitan. (Sorry it took so long I’ve been busy!) 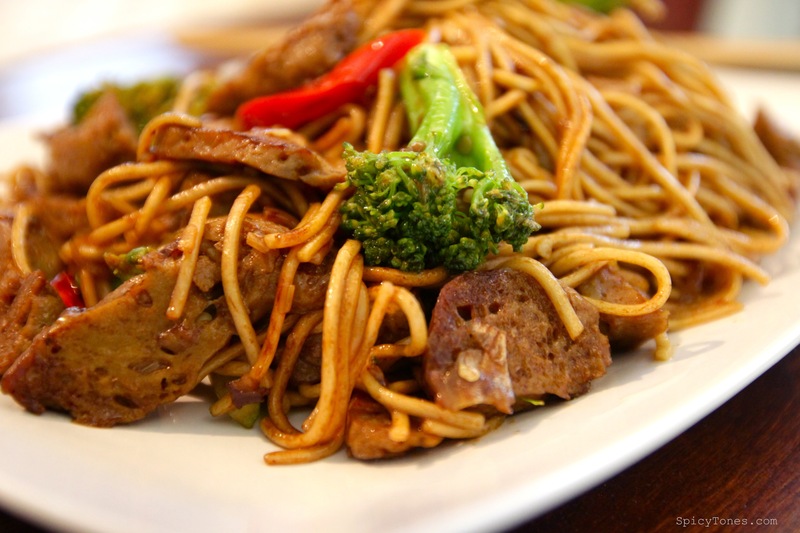 It is really easy, just add it in noodles, or anywhere to replace meat in meat dishes. 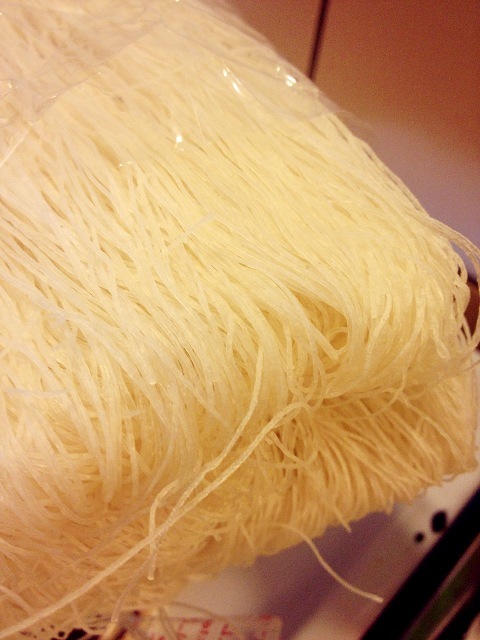 Lately I have felt in love with this ‘long-life’ noodles or Yi Mein. Hmm, they are so so good! To me they are best with just fried shallots and a dash of salt. Perfect! Simply irresistible. But today I’m making one that is heavier in taste. Here you go. 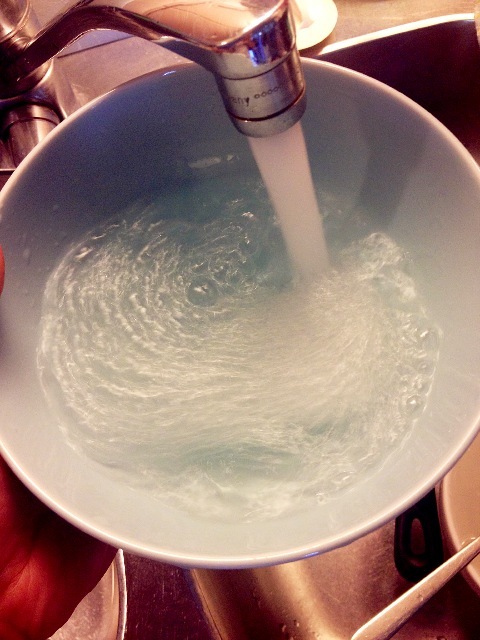 1) Boil water in pot, add in some oil and salt. 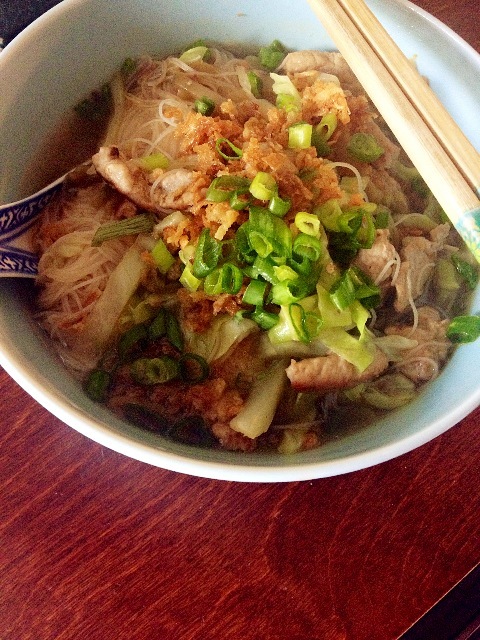 Cook noodles according to instruction or until soft. Drain and set aside. 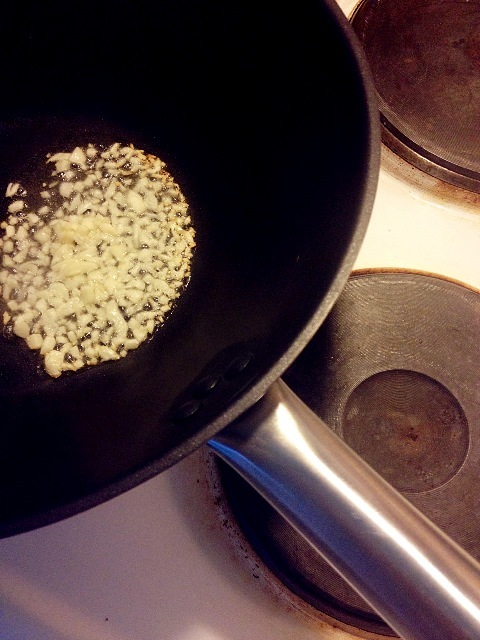 2) Heat up oil in wok pan, fry shallot until golden brown and fragrant. Add in garlic and seitan. Add oyster/ mushroom sauce and mix well. 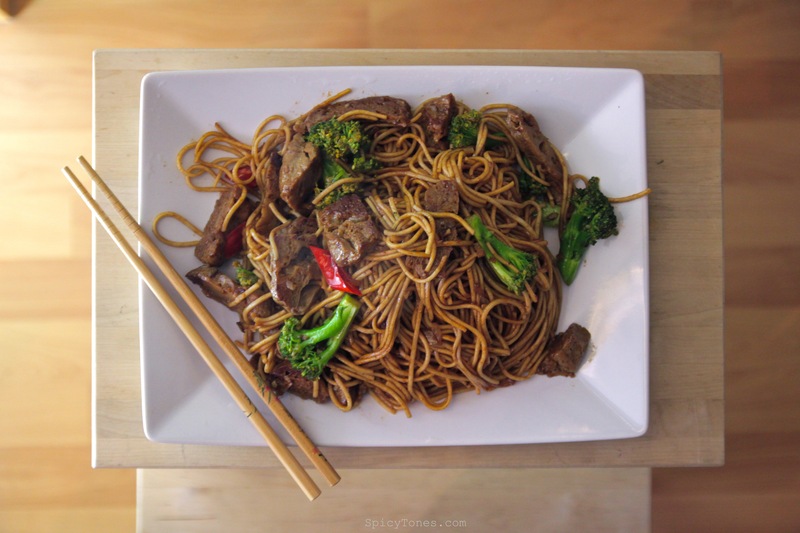 3) Throw in broccoli, stir-fry until cooked. Add in noodles and the rest of the ingredients. Stir-fry until everything is well mix. 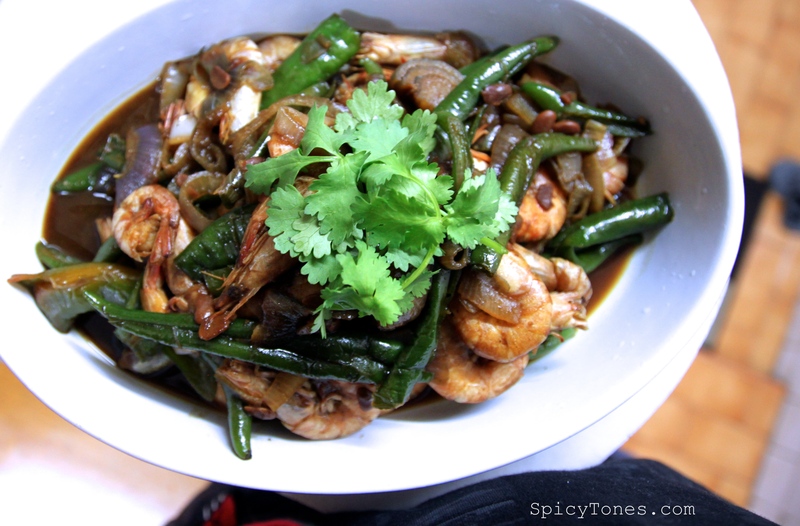 Serve with optional chopped spring onion or coriander. I was pretty happy because I made this dish for my brother in law and my sister, they were very surprised and impressed just how good this seitan tasted! In fact my sister asked me to make her another seitan dish the other day. They actually apprecited this type of vegetarian food. You must try and cook this sometimes if you want to get high protein source from your food. Well and again, not for gluten intolerant friends. I don’t really know why this noodles are called long-life or longevity noodles, but it is a dish that we eat during birthdays, Chinese New Year or weddings, since the name represents ‘long-life’, it acts as a wish to bring the fortune and luck to live longer life to someone. And it tastes good. Win win. It’s been awhile since I wrote last time. Guess what, I finally finished my thesis! 78 pages, I’ll be graduating and getting my Bachelor’s degree in March. 😀 FINALLY! And right after I finished my thesis, I flew back to my home country Malaysia. It’s been 7 years since I last spent Chinese New Year with my family. Like celebrating Christmas, Chinese New Year is a big deal to the Chinese people. During these times, we eat, laugh, talk or actually scream like all the time. Chinese New Year lasts 15 days, you have to have and wear everything clean and new especially on the first few days. Therefore when we got here to Malaysia, my sister and I spent the first couple of days shopping for new clothes, and bought all kinds of food ingredients. It is because people in Malaysia have 6-7 public holidays during Chinese New Year. Shop owners particularly the Chinese people close their shops or stop working for at least a few days, some even rest for 2 weeks. 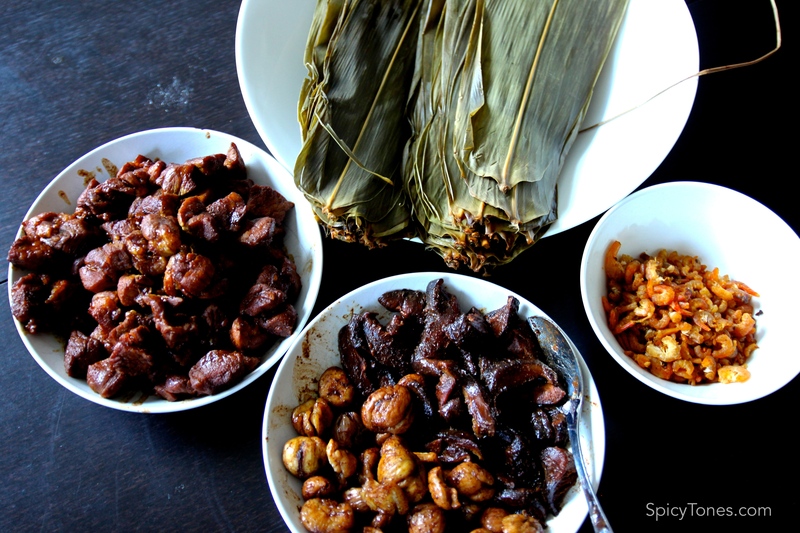 It is a must to travel home and eat ‘Tuan Yuan Fan’ meaning re-union dinner with your family. I was so happy, because after 7 years, I finally made my way home for re-union dinner! My little sister said that this year the atmosphere of Chinese New Year is very strong, just because we are all here celebrating with them… I’m touched, I should make my decision that I will go home for re-union every year. I only need to apply my holiday from work a year before then. 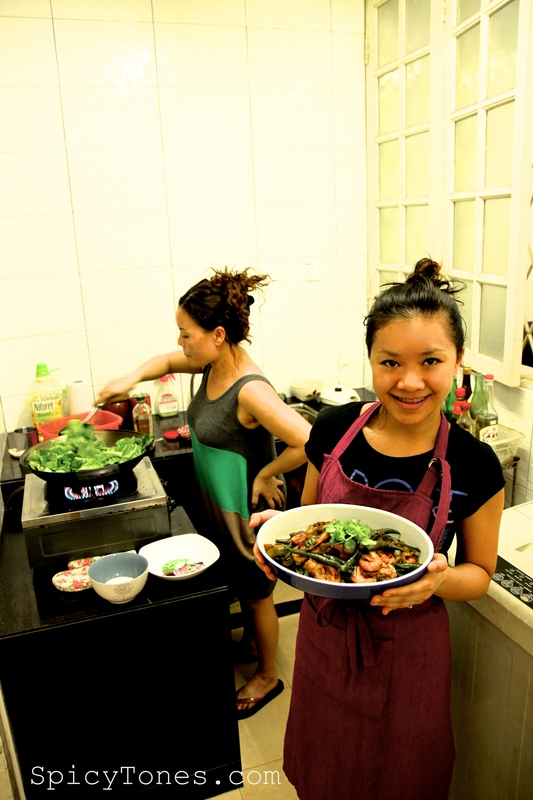 Long story short, my mom asked me to cook since I had the guts to run a food blog publicly. Well, I have to show my skills and prove it to her in reality. So I did. 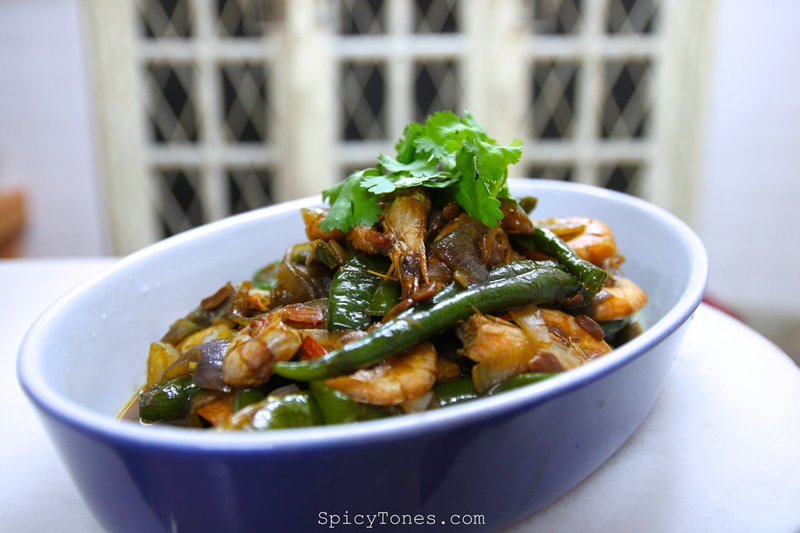 This time I’m making my Grandmother’s own recipe, prawns with a lot of green chilies, my sisters’ favourite. My mom also gave praise for it. And I’m sharing this family’s recipe with you, I hope you will like it! 恭喜发财 Gong Hei Fat Choi! 1. Cut vertically from the back of the prawns and remove the intestinal track of the prawns, washed and set aside. 2. 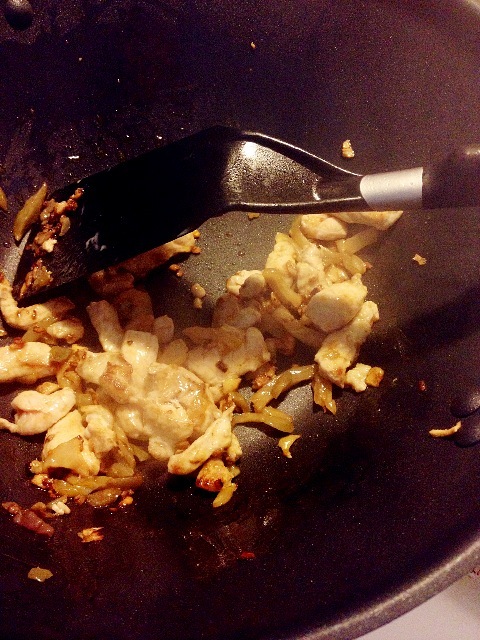 Heat up oil in wok, put in sliced onion and green chilli, stir-fried for 3-4 minutes until fragrance. 3. Add in prawns, and stir-fry until cooked. Add in fermented bean sauce, soy sauce, sugar, shaoxing wine and chicken powder. Mixed well. Add water, cover with lid and let it simmer for a few minutes. 4. 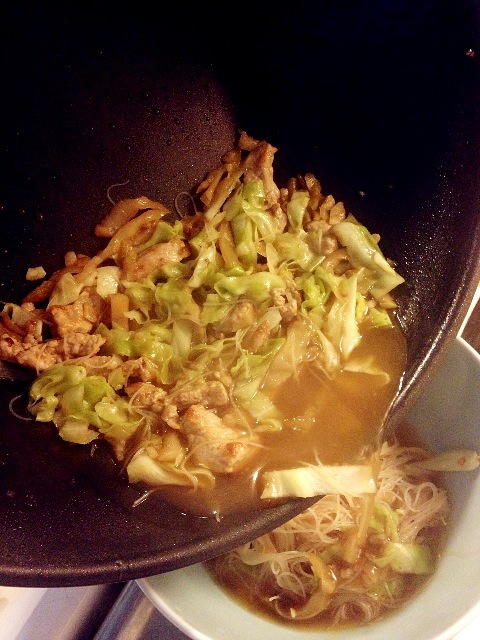 Open the lid, stir-fry until most of the liquid drys up/absorbed by the dish. Turn of heat and serve. Just if you are wondering, that one sausage was not supposed to be there! 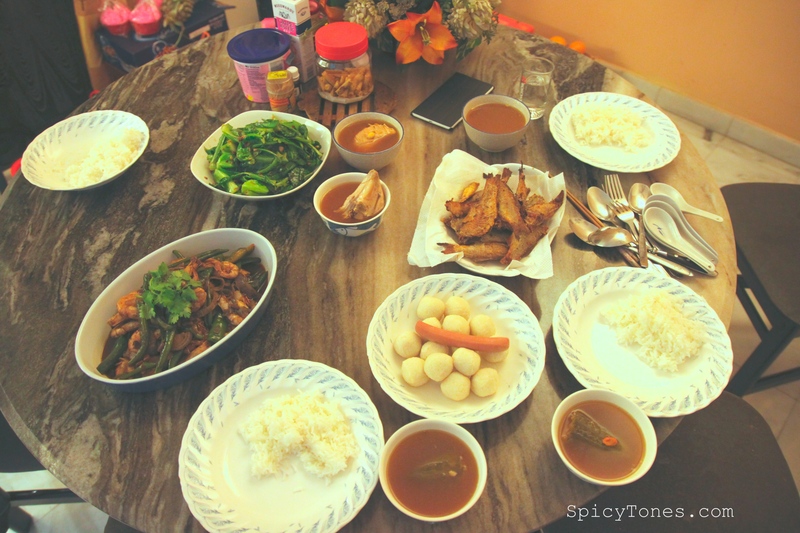 😀 My mom found some left overs… On this day we decided to eat ‘less fancy’ because the next day is the Chinese New Year Eve when we eat our lungs out! 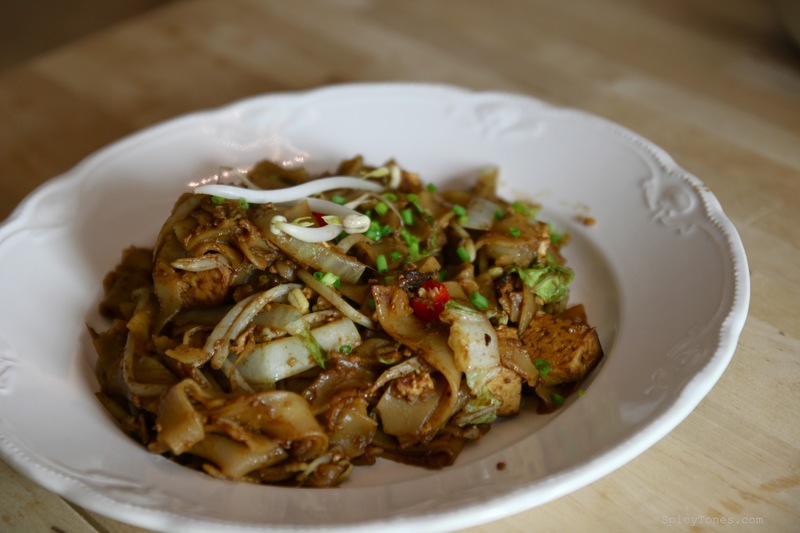 Char Kway Teow is said to be a dish symbolizes the Chinese people who came to Malaysia in the very beginning from the South of China. It is a street dish tossed with high heat and it generates high turnovers, like the hard-working Chinese people. It is true that these Chinese people are everywhere around the world. You see, every corners I’ve been, there are always Chinese restaurants somewhere, no matter if they are selling sweet & sour , thai food or sushi. They are all very hard-working business people. They go everywhere around the globe to look for opportunities. As I said a thousand times before, I love noodles. 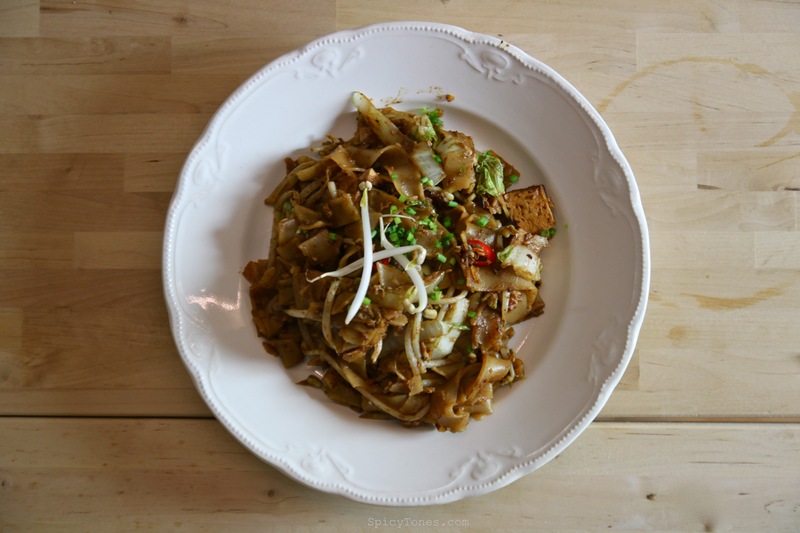 Char Kway Teow is rice noodles coated with soy sauce, garlic and most importantly, packed with a strong, burned ‘wok’ flavor. Just like a perfect plate of fried rice, you got to have the ‘wok’ taste in it then you can call it right. You know, those that you might have gotten from the best restaurant in town. To get the ‘wok’ taste, it’s all about the ‘woking’. 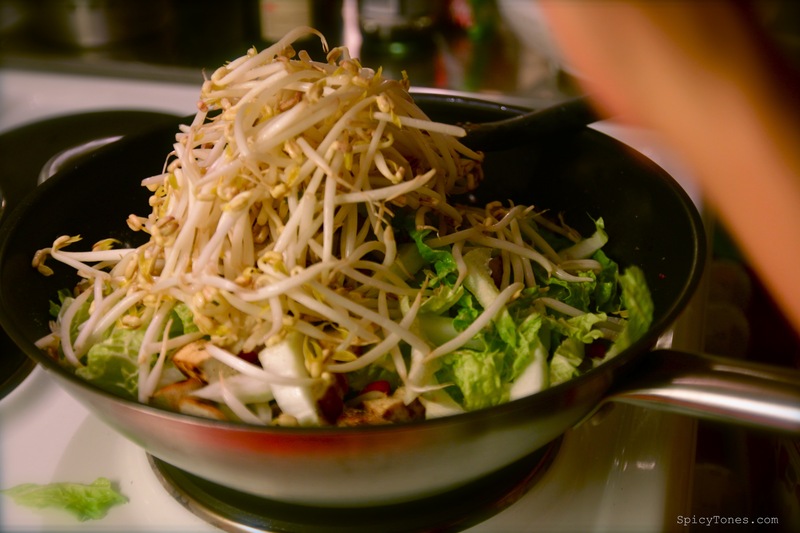 You’ve got to have your wok steaming hot and stir it real fast. With my home stove, the ‘wok’ flavor I managed to get was from the slightly bit of burning, and yet it is not the same like the one from the street back home. Unless you have a really big fire and a steady wok pan, you must let it burn a little in order to get there. 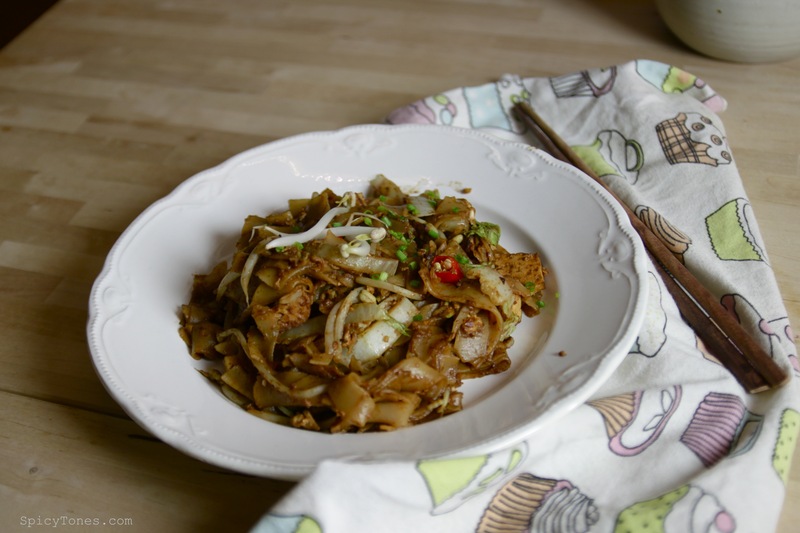 Char Kway Teow is a popular dish favored by all ages, always. Back home, you can get one steaming hot portion of Char Kway Teow with 50cent, maximum 1 Euro. The street hawker always ask: ‘With or without chili? With or without eggs? With or without clams?’ Anyway it is just as good, so easy! 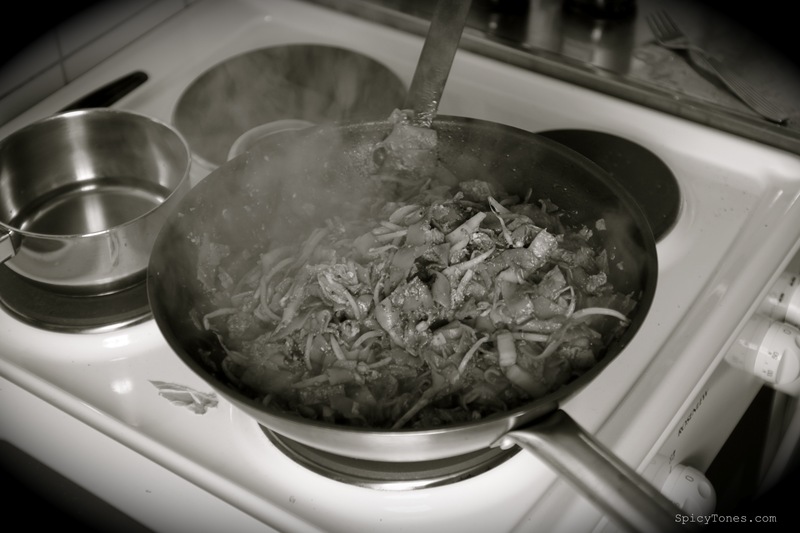 If you have a super good, well heated stove at home, even only the dark soy sauce will do it perfect. It is not difficult to make, and it still tasted so good on the next day from the microwave. 🙂 What an efficient dish! 2) Add in the noodles, soy sauce and dark soy sauce. Stir with high heat until the noodle is well coated and dried. 3) Toss in all the vegetables and tofu. Mix well. Make a well in the middle and break in the eggs. Wait until the eggs are half-way cooked and then stir well with the noodles. 4) Season with salt and pepper. Dish up and enjoy with fried onion.